Woohoo! Another Fun Friday and it’s time for grilled peppers. We were out on a long drive last weekend to take advantage of the great weather. On our way home we stopped by some farm stands selling gorgeous, fresh produce. There were lots of corn, new potatoes, cucumbers, zucchinis, a variety of peppers, sweet onions, and juicy tomatoes. I bought a little bit of everything and couldn’t wait to get home to put them on the grill. 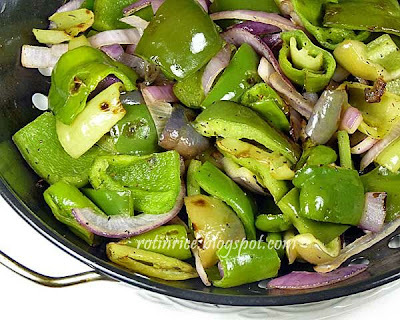 I roughly chopped up the onions, sweet green, purple, and banana peppers and threw them into the grill pan. Seasoned them with thyme, freshly ground flavored sea salt and pepper and a good drizzle of extra virgin olive oil before putting them on the grill. Ro-Ri San also grilled some nice juicy steaks and beer bratwursts we bought from the butchers. The aroma from the grill was just fantastic. As soon as the goodies were done on the grill, I allowed the steaks to rest while I made a simple vinaigrette of lime juice, agave nectar, and extra virgin olive oil for the peppers. I transferred the grilled peppers to a salad bowl, tossed in some baby yellow tomatoes and thinly sliced basil from the garden, and poured in the dressing. I gave it a good toss and dinner was served. Enjoy…..and have a great Labor Day weekend! 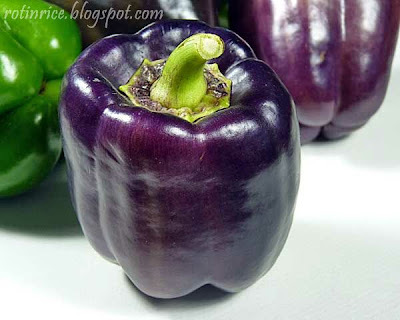 Biren, I never seen a purple pepper before. Looks pretty! That plate of salad also looks so refreshing and appetizing. They are not often seen here except during the summer. I used to grow them when I was in Colorado. They do turn green when cooked. The purple peppers look so beautiful..never seen them before..
That is totally my kind of salad.. love love grilled peppers ..looks delicious !! what a wonderful salad! Those purple peppers were beautiful! I hope you have a great labor day weekend! This is very first time I have ever seen purple pepper! The salad looks absolutely scrumptious. Hope you have a relaxing weekend, Biren. Oh? I did not know that green, red, and yellow all come from the same bush. I did grow these purple guys once in CO but I don't remember at which point they turned purple. The plant only had time for one fruit before the cold weather set in. I thought they were purple from the beginning but I could have been mistaken. Never seen purple pepper before. Your salad is very healthy and colourful! 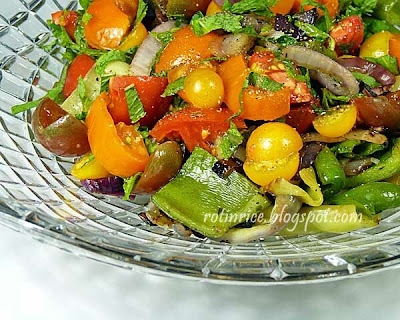 Very refreshing salad dear…..I have never seen purple capsicum before…..very rarely seen…. Oh my, what a beautiful salad! That's exactly what my mind was thinking as soon as I saw your picture. I seriously stared at it for a goo 30 seconds before going on to read lol. I've never seen a purple pepper before. I never even knew they existed. Beautiful colours and presentation Biren! Sounds delicious! I love your purple peppers! This dish sounds so simple and tasty! And being from Wisconsin, your mention of bratwurst got my mouth watering. I grew up eating the stuff and absolutely love it! Have a fabulous holiday weekend! What a beautiful purple pepper! I've never seen one before, and I imagine it tastes wonderful in this fresh, grilled salad. Thanks for sharing such a healthy recipe! It is definitely time for grilled peppers – I have a bunch waiting for me to grill as well 🙂 That purple pepper is very neat, and the salad looks delicious! What a beautiful purple pepper! never seen it before. Wonder what colour next…haha. Love your salad…so healthy, refreshing and summery. Grilled veggies can never steer you wrong! Great dish. Happy Labour Day to you Biren…love the colour of that purple pepper! first time I am seeing it. Looks like a very delicious salad to me too! Look at all of those beautiful peppers. I'm just home from our farmer's market with lots of peppers in tow. Plan to do the same thing..
Oh I've never seen a purple bell peppers, what a great color. The salad looks delicious and super healthy, perfect! I like the colors of this dish and bet it is delicious with that smokey element. I've never seen a purple pepper and it is stunning! I first thought it was a purple eggplant till I looked closer. Wonderful salad – you never can go wrong with grilled vegetables.